Experience the best of the Pacific Coast while riding one of the most spectacular bicycle routes in the world. 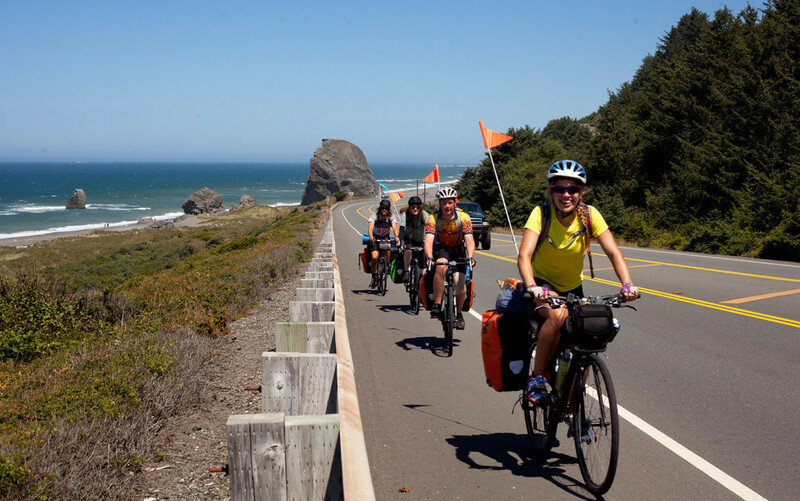 On this amazing cycling trip your group will pedal along the famously beautiful coasts of Oregon and California. Miles of beaches and bluffs, endless ocean vistas, ancient redwood forests, and rolling farmlands…these are the scenes that make the Pacific Coast one of the most stunning adventure locations in the country. 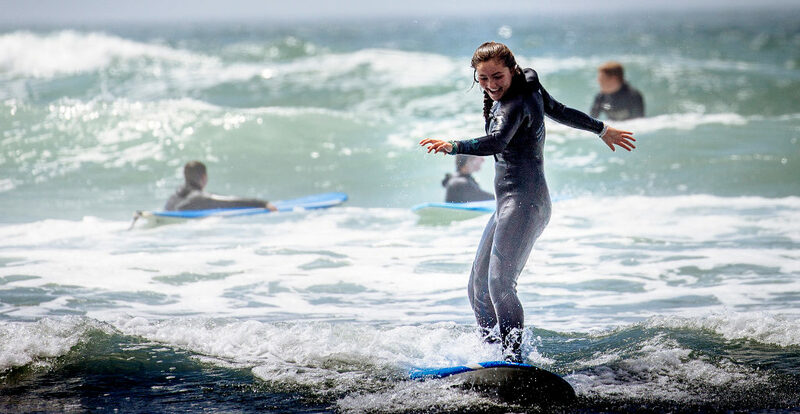 Along the way, you’ll also take a surf lesson on a California beach and lend a helping hand on a service project in Redwoods National Park. 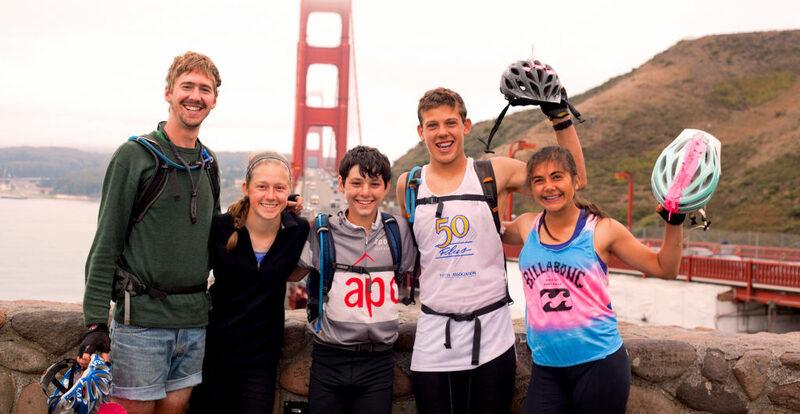 Three weeks and 600 miles later, you’ll beam with pride as your group crosses the Golden Gate Bridge, the final jewel in your crown on this exciting point-to-point, biking adventure. We’ll meet in Eugene and transfer west to the Pacific Ocean and Florence, Oregon. Heading south from there, we’ll wind our way down the Oregon coast, past sandy beaches with rolling waves and giant rock formations. Nights will be spent in state parks right on the water’s edge. Shortly after crossing into California, we’ll spend an exciting day off our bikes taking a surf lesson with professional instructors near Crescent City. Our route takes us along California’s meandering Lost Coast, and into the majestic redwood forests. 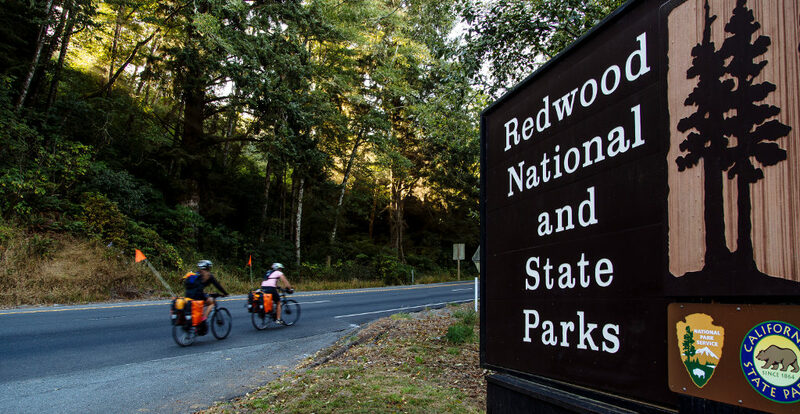 Pedaling along the famed “Avenue of the Giants,” we’ll be humbled by these ancient, towering trees. Continuing south, we’ll follow scenic Route 1 past small towns and salt water farms, and take a day off our bikes along the way to explore the charming, seaside village of Mendocino. A few more days of riding bring us to our final destination: beautiful San Francisco! Spirits will soar as we see the Golden Gate Bridge stretch out before us and lead us across the bay to this great city. After spending our last full day together exploring the sights of San Francisco, we’ll enjoy a festive farewell dinner at one of the city’s great restaurants to celebrate the many accomplishments of our amazing journey. How physically challenging is PC? Given a rating of Challenge Level 6 (out of a maximum of 10), we consider PC to be an intermediate to advanced cycle-touring trip. We do believe that any moderately fit, motivated student, who trains ahead of time, can successfully rise to the challenge of this trip. Compared to similar cycling trips, we believe that PC is more challenging than Vermont to Montreal (due to trip length, added mileage, and more challenging terrain), but easier than our Europe Coast to Coast and America Coast to Coast cycling trips. Our PC trip will average approximately 40 miles on each riding day, but has challenge days that will include rides of approximately 60 miles. Please note that all of Apogee’s Challenge Levels are not scientific and are subjectively calculated by the Apogee staff. Our PC groups will be camping at established campgrounds for most nights on our trip, but we will spend the final two nights of the trip indoors in a hostel in San Francisco. Leaders will separate students by gender into tent groups, and will rotate those groups several times over the course of our trip. Students will share a tent with one or two other students. Absolutely. Apogee’s trips are designed around the concept of “achievable challenge” – anyone who has a strong desire to challenge themselves and possesses a basic to moderate level of physical fitness is already well-prepared. Upon your child’s enrollment, we will send you a suggested training schedule that we highly recommend your child completes prior to his/her trip. Training beforehand (especially with panniers and weight) will directly contribute to good risk management and your child’s physical comfort. No – we offer rental bikes (as well as panniers) for an additional fee. In 2019, the cost of a hybrid rental bicycle for the three week trip is $325. Waterproof rental panniers are available for $75 for the three weeks. If your child already has a bike that is appropriate for this trip, they are welcome to bring it. Please call our office with any questions regarding the suitability of your child’s bike for this trip. Students using their own bikes on PC will ship their bikes ahead of time to our bicycle outfitter who will build it up before the trip. Apogee will box and ship the bike back to the student’s family at the end of the trip. We will provide detailed bike shipment information with our trip materials in the spring. Yes. While all of our bike trips are self-supported – meaning that students and their leaders will carry their clothing, cooking gear, etc. on their bikes – Apogee maintains a dedicated support staff member and vehicle on our Pacific Coast trip to provide assistance in the event of medical or mechanical exigency. What will the community service project be like on Pacific Coast? The specifics of our community service projects and the number of hours we volunteer varies slightly from year-to-year. In the past, we have worked with a local Eureka food bank, Food for People, on a variety of tasks including food organization, cleaning, etc. Students can expect 3-5 hours of community service work over the course of our trip, usually in a single day. You can expect to receive a phone call from your child three times during their trip, about once per week. Please note that Apogee staff members do not travel with students; our trip leaders will already be in Eugene, Oregon on arrival day and will stay in San Francisco after the trip ends. Apogee staff and trip leaders will have a detailed flight itinerary for each student who is flying to the trip start and will be at the airport to greet them on arrival. Once students are with their leaders, they will call home to let their parents know they have arrived and are with their group. Please see our blog post for specifics regarding students traveling as Unaccompanied Minors. Further, we encourage you to coordinate travel with other attendees; we’re happy to put you in touch with other enrolled families from your region. We will provide enrolled families with a Travel Information document covering details specific to traveling to and from the West Coast, including airport information and arrival and departure time windows. Please contact Apogee with any specific questions or concerns regarding drop-offs and/or pick-ups. Apogee’s tuition costs are meant to be all-inclusive and include all meal, accommodation, and activity fees. The most significant additional expenses on our Pacific Coast trip will include travel to Eugene, OR, and from San Francisco, CA, a sleeping bag and sleeping pad, a bike helmet, and a bike and panniers (rentals are available, see above).